Quick question: Can the Pretty Little Liars hang out with each other these days? I'm not sure if that's been established yet. Repetitive driving home of a ridiculous, useless point/plot aside, "Blind Dates" actually got me. I was preparing for the concluding scene to be yet another red herring, another example of the show building up a supposed mystery, only to scarcely answer any questions while tossing out a few more. Then Melissa screamed, we saw Ian's body, gun in hand, alleged suicide note on the ground and it all changed. I was legitimately shocked. Hehe, you make A look sane. But, hey, you're a lesbian like me. Let's hang out and lie to my mom! Did anyone see that coming?!? Think of all the questions the development opens up: How did he survive the bell tower night? Did someone help him? Did that same someone kill him? Could it have been an actual suicide? 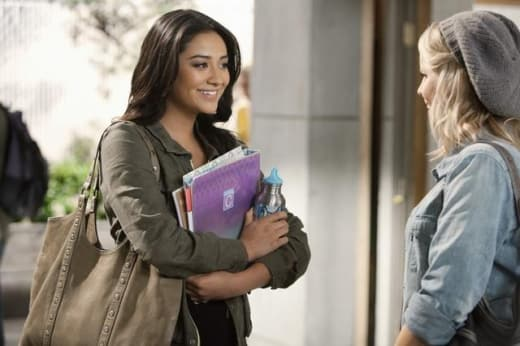 Hanna, Dead Girl Whisperer: There's real potential here of Hanna struggling with who she is. I actually hope she's wrong and she hasn't moved on from her friendship with Alison because I was always intrigued by the fat, insecure girl she used to be. Let's explore this teenager's internal battle more. Mike, Myserious Non-Basketball Player. It's hard to care about someone we've barely met or heard from in months, but I've grown a bit sick of the Ezra/Aria back and forth. Let's shine a light on Aria's family and see what jumps out. Lucas, Unexpected Stud: Granted, this made little sense. A week ago, Danielle didn't know who Lucas was. Then, after days of him admittedly NOT acting like himself, she likes him to the point that she's concerned over Hanna's feelings? But whatever. The more Lucas the better, I always say. Pam Fields, World's Worst Mother: Seriously, Dina Lohan has nothing on this woman. Let's think about the Danby arc for a moment: Emily's mom insists they'll only stay in Rosewood if Danby can guarantee her daughter a scholarship. The school does so (in Pam's eyes). A girl Pam has just met (Samara, who could give A a run for her stalking money) then convinces her that the family should actually NOT rely on this college and explore other options. Pam immediately agrees, uttering an immortal line: Well... that seems to make a reasonable amount of sense. Unlike last week, I tried to sit back and just enjoy Pretty Little Liars for what it is. Were there plot holes and a lack of continuity between characters and storylines? Absolutely. But did I also turn off the TV stunned by the ending and hopeful for next week? Yup. What else should one ask for out of this show, right?